Liberty University is committed to cultivating an atmosphere of camaraderie and support among our military student population. Each semester, the office of Military Affairs plans events just for our military student population. This not only gives you an opportunity to connect with other military students, but also gives us the chance to extend our gratitude for your service. Whether you are a current service member, veteran, or military spouse, we hope to see you at an upcoming event. If you have any questions about Liberty University Military events below, please contact our Military Outreach team at militaryoutreach@liberty.edu. 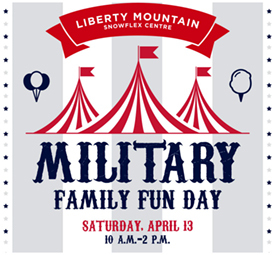 Liberty University service members, veterans, and spouses are invited to attend our annual Military Family Fun Day at Liberty Mountain Snowflex Centre. Enjoy a day of tubing, skiing, or snowboarding on the slopes, as well as other activities for the whole family. The final RSVP deadline was April 5, and has now closed. Proof of service is required for your family’s free entry to this event (tubing is free, but the cost of any other equipment rentals is not included). Bring your military ID card, a copy of your discharge orders, DD-214, Veterans card, or discharge certificate for proof of your service in the military. If you have any questions, email us at militaryoutreach@liberty.edu. 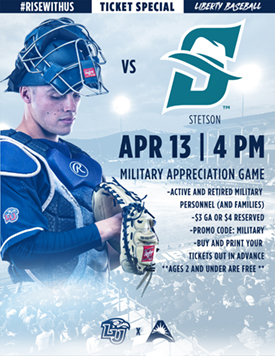 Come out to the Military Appreciation Baseball game on April 13 to watch the Liberty Flames take on Stetson. Active and retired military personnel (and their families) receive $3 general admission or $4 reserved. Ages 2 and under are free. Lynchburg, Virginia offers a wonderful community for military veterans and their families. There are frequent events in the local community sponsored by the Lynchburg Area Veterans Council, the American Legion, and other local organizations. We'll post those opportunities here as we become aware of what is being planned. If you live in or near Lynchburg, we hope you will take advantage of the wonderful community of support here in Lynchburg, VA! Looking for more ways to connect? Visit our Military Outreach webpage for more information on how you can get involved in Liberty University’s military community.